Scottish Producers Pop In and Pop Up! Our Scottish Year of Food and Drink in 2015 was such a huge success that we are continuing our producer showcases throughout 2016! Our weekly spotlight on individual producers is a chance for you to celebrate Scotland’s natural larder and quality produce by meeting producers face to face and tasting their products for the first (or second or third) time. If you haven’t already, sign up to our newsletter for updates. 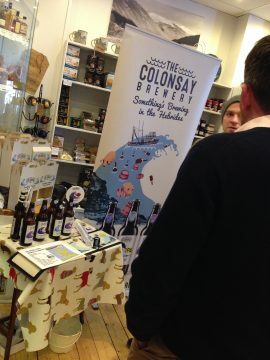 Photo: Colonsay Brewery really know how to serve a great taste of their beer! Our 2016 Scottish producer showcases are on Thursdays, 3-6 pm with some dates awaiting producer confirmation so keep an eye on the list below. May 5: Roots Soda Co.